DENMARK – Cody Stelmach remembers well his first introduction to the five seniors who would one day bring his program a conference co-championship, a regional title, a sectional crown and a trip to Madison and the state tournament. He was still a player at St. Norbert’s and the Denmark basketball program was five years removed from its last conference championship – a 13-0 run through the Packerland Conference in 2006-07. Stelmach was a sophomore on that team. That title team would be the last opportunity for Viking fans to celebrate for a long, long while. What followed over the next six seasons was one winning record in league play and a 27-53 overall conference mark, including, in 2011-12, a 1-15 campaign. Bart Gezella, the sixth-grade team coach (who along with Jeff Jens, Craig Satori and Mike Suemnick made up the Denmark youth program coaches), gave Stelmach a call over at St. Norbert’s and asked him to come take a look at his current crop. This was the beginning of the 2012 season. Gezella was trying to interest Stelmach into getting into coaching and wanted him to work with his team. Among the players on Gezella’s team that day were his son, Zach Gezella, as well as Zane Short, Jack Satori and Brady Jens. Three of them had been playing together since second grade, while Jens started playing in fourth grade. A fifth, Patrick Suemnick, was joining the group for the first time in that fall of 2012. Denmark continued to struggle, going 3-13 in the 2013-14 season, followed by 7-9 and, in Stelmach’s first two years at the school, 7-9 and 7-10. By the time the 2016 season rolled around, those bright-eyed sixth-graders were sophomores. Short and Jens each averaged in double figures that season, while Suemnick came in at 8.1 points and a game. Satori was already establishing himself as an invaluable role player and defender. The Vikings snapped a seven-year losing skid that winter, going 11-7. Though the Vikings could only match that mark in 2017-18 and, like in the previous season, fell in the second round of the regionals, they also competed in every game, their seven league losses coming by a combined 40 points. In other words, 11-7 might have been so much better, and hope for the following season lay dormant over the next eight months. This past fall, Denmark added the fifth of those promising sixth-graders into the varsity mix in sharp-shooter Zach Gezella, giving them a five-man starting unit that had been playing together, some of for as many as 10 seasons and, in the case of Suemnick, for six. Stelmach cites, in particular, the Oconto Falls game on Feb. 11, when the Vikings found themselves trailing by six with two minutes to go to a team they had earlier beaten by 26 and which was in last place the entire season. Lose to them and they could kiss their conference title hopes goodbye. It helped to have some seriously good basketball players, of course. Pat Suemnick was just named to the D3 All-State First Team, while wing man Zane Short was an Honorable Mention. Both were First Team All-North Eastern Conference. Jens and Gezella were both Honorable Mention NEC, and Satori was in the running for NEC Defensive Player of the Year, though he lost out to Freedom’s Devin Baumgart. But the Vikings were also short-handed, often playing a rotation of just six. What most impresses Stelmach looking back on this bunch was their tenacity and boldness, their willingness to dream big. They began talking about getting to Madison way back. Through it all, Stelmach says his players matured into fighters on the court who were humble off it. All were thoughtful and smart and reflective and polite in post-game interviews and that, Stelmach says, reflects the principles the program tries to instill from the beginning. “The kids bought into the unity, the unselfishness, the humility,” he says. “It maybe took a few years to get it all to stick in their minds, but as they matured and got older, it was cool to see them show those principles. I think some of that humility came from knowing nothing was going to be given to them. They weren’t coming in each year off undefeated seasons and no one was expecting anything from them. 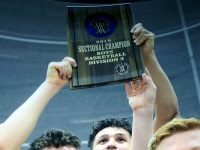 Stelmach hugged the seniors as they came off the court in the waning minutes of the loss to Waupun on March 14 at the Kohl Center, sharing a few words with each of them. He says it wasn’t a sad moment really, though it wasn’t easy saying good-bye to the group he had shared so much with over so many years.